When, where and to whom was William Henry Rouse born in about 1832 near Truro (or Redruth), Cornwall? 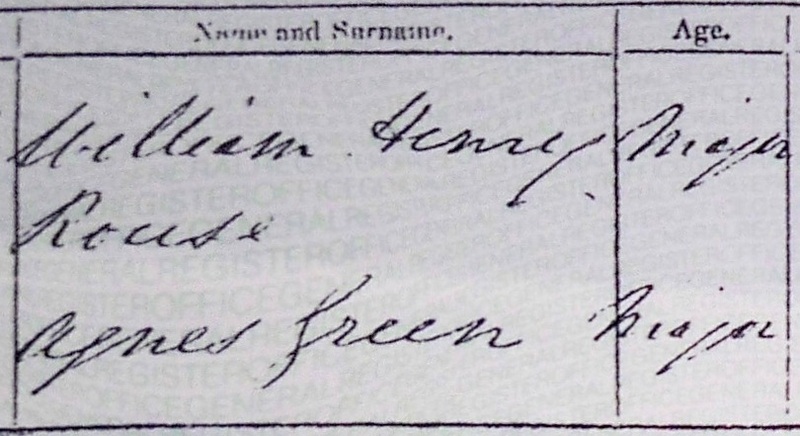 My 2nd great grandfather William Henry Rouse married Agnes Green on 4 Aug 1853 at St Clement, Cornwall. On their Marriage Certificate the Age for both of them appears to say Major, which I assume to mean over 21. From this I deduce that William Henry Rouse was born no later than about 1832. On the Marriage Certificate William Henry Rouse's occupation was Clerk and his father, called William Rouse, had the occupation of Plasterer. When he died of tuberculosis on 8 Feb 1887 at Adelaide, South Australia, the age given on his death notice was 49 years. If correct, this would mean he was born in about 1838.
the 1851 Census when William Rouse, a Grocer's Assistant aged 18, born in Truro, was living at Truro St Mary with William Hobbs 48 "Brother-in-law", Elizabeth Hobbs 35 "sister", Elizabeth J Hobbs 13 "niece", and Kitty Rouse 76 "mother". The relationships here are all placed I double quotes because I am extremely sceptical that his mother was aged 58 when he was born and I believe Kitty (born Christian Crossman) was probably his grandmother. His age at this Census would mean he was born about 1833.
the 1861 Census when William H Rouse, a Traveller in Flour and Groceries, aged 29, born in Truro, was living at Truro St Mary with wife Agness Rouse 29 and children Henry Rouse 7, Clara Rouse 5, Kate Rouse 2, and William Rouse 8 Months. His age at this Census would mean he was born about 1832.
the 1871 Census when William H Rase 38, a Grocer, aged 38, born in Truro, was living at Truro St Mary with wife Agnes Rase 38 and their children Henry Rase 17, Clara Rase 14, Catherine Rase 13, William Rouse 10, Elizabeth Ann Rouse 9, Mazzie Rouse 8, James Rouse 6, and Harriet Rouse 3.His age at this Census would mean he was born about 1833. 9 year old Labourer named Will Rowe (could possibly be Will Rouse) appears to be living at Truro St Mary alone alongside or next door to William Hobbs, his wife Elizabeth (nee Rouse) and their daughter Elizabeth (aged 6) - who were in the same house with William Rouse 10 years later. If this is him, then his age at this Census would mean he was born about 1832. 8 year old Pupil named William Rouse living with a Dissenting Minister named James Hart, his wife, two children, Elizabeth Tyeth (perhaps his mother-in-law), and eight other Pupils at Fore Street, St James, Tregony. I thought I had a record of him from FamilySearch where William Henry Rouse was christened on 24 May 1836 at Redruth St Uny, Cornwall to parents William Rouse and Elizabeth. However, I have recently found a newspaper article (supported by a death record) in the Royal Cornwall Gazette of 21 Jan 1848 that leads me to believe that this William Henry Rouse cannot be the William Henry Rouse (son of William Rouse the Plasterer) who married Agnes Green in 1853. Almost all of the evidence above points to a birth date about 1832-33 and is at odds with the age given at death many years later in another country (1838). My theory is that William Henry Rouse was the grandson of "Kitty" Rouse, and possibly/probably the illegitimate son of William Crossman Rouse (born 5 Sep 1813, christened 26 Sep 1813; a Plasterer from multiple Census Records). William Crossman Rouse married Eliza Reed on 25 Jun 1838 at St Day, Cornwall and had nine children including another William Rouse in 1841. Does anyone have any thoughts on where else I might be able to look for them? To look hard and not find them I think makes my theory a little harder to disprove. I've looked unsuccessfully for whether the birth of William Henry Rouse may resulted in a paternity bond. An interesting aside is that the grandfather of William Crossman Rouse, Edmund Rouse paid a paternity bond in 1785 at St Clements when his son George fathered an illegitimate child of Jenefer Webb. In the 1851 Census there is a William Rouse aged 18 living with his brother-in-law's family. This would make him Elizabeth's brother. William Crossman had a younger sister Elizabeth who married William Hobbs. Kitty Rouse is the right age to be Christian Crossman who married Edmund Rouse in 1801.
william Henry's marriage certificate to Agnes Green in 1853 states his father as being William Rouse a plasterer. William Crossman Rouse was a plasterer by trade. So although the evidence is circumstantial I would take all the bits added together and think that the probability is there. I am 2 x great grandson of William Crossman Rouse. I too have come across William Henry and have come to the same conclusion that William Crossman and someone called Elizabeth had a child out of wedlock. It is interesting to note that his eldest son Henry Green Rouse stayed in Cornwall when William Henry went to Australia. Rouse    WilliamH        42      Ag Lab      "To William Rouse of StaffordStreet Adelaide"
The 1878 Boothby Directory has William Rouse (a Mason) living in Stafford Street. The 1881 and 1882 Boothby Directories show William Henry Rouse (Grocer) living/working near William Rouse (a Mason) in Stafford Street, Adelaide. William Rouse, the Mason, appears to be William Henry Rouse's half-brother William (William Crossman's first son to be born within wedlock), a Mason from Redruth (Cornwall) who immigrated to Port Adelaide with his wife Elizabeth Jane aboard the Clara in 1865.
aboard the Clara in 1865 with wife listed as Elizabeth Jane (Terrill ?) and their infant son William who died during the voyage. My hunch for why William Crossman Rouse may have had two sons named William is that the Reed family, into which he married, may not have known about the first William (William Henry) until some time after the baptism of the second William. Thanks for contributing an answer to Genealogy & Family History Stack Exchange! Not the answer you're looking for? Browse other questions tagged cornwall baptism-records 1830s or ask your own question. What can I infer about John Wright from this 1841 census entry? Finding birth record for William R Rediker who was born ca 1832 in USA? Where was Charlotte Hancock, usually of Lewannick, Cornwall, for the 1851 Census? Where was Matthew Nettell, of Illogan, Cornwall, for the 1861 Census? Establishing identity of Edmund Rouse of St Clement, Cabinet Maker, Private in Napoleonic Wars and Weaver? Seeking baptism record for William Slight, born ca 1832 near Haddington, East Lothian, Scotland? Did Somerset Militia recruit local Cornish soldiers when based at/near Truro around 1798? Interpreting 1832-1839 Bodmin Gaol records for George Wills of Illogan? Identifying birth family of Elizabeth Chichester who married in 1799 at Old Cleeve, Somerset, England? Could Snows X be intersection of Snowsfield and Crucifix Lane, Bermondsey? Could Francis Tolvert Greenway baptised 1774 at Falmouth be Francis Green who married Grace Woodley 1798 at Totnes?